In 1926, 65 years before the events of the first Harry Potter film, British wizard and "magizoologist" Newt Scamander arrives in New York, en route to Arizona. He encounters Mary Lou Barebone, a non-magical woman ("No-Maj" or "Muggle") who heads the New Salem Philanthropic Society. As Newt listens to her speaking about witches and wizards being real and dangerous, a Niffler escapes from Newt's magically expanded suitcase, which houses various magical creatures. As Newt attempts to capture the Niffler, he meets No-Maj cannery worker and aspiring baker Jacob Kowalski, and they unwittingly swap suitcases. 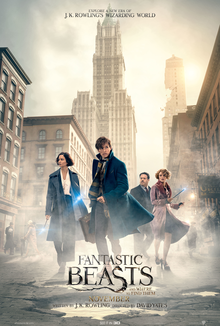 Demoted Auror (hunter of dark wizards) Tina Goldstein arrests Newt for the chaos caused by the Niffler and takes him to the Magical Congress of the United States of America (MACUSA) headquarters, hoping to regain her former position. However, as Jacob's suitcase contains only baked goods, Newt is released. At Jacob's tenement apartment, several creatures escape from Newt's suitcase. After Tina and Newt find Jacob and the suitcase, Tina takes them to her apartment and introduces them to Queenie, her Legilimens sister. Jacob and Queenie are mutually attracted, though American wizards are forbidden to have any contact with No-Majs. Newt takes Jacob inside his magically expanded suitcase, where Jacob encounters a contained Obscurus, a parasite that develops inside magically gifted children if they suppress their magical abilities. Newt extracted it from a young girl who died, those afflicted rarely living past the age of ten. Newt persuades Jacob to help search for the missing creatures. After they re-capture two of the three escaped beasts, Tina returns the suitcase to MACUSA. Officials arrest them, believing one of Newt's beasts to be responsible for killing Senator Henry Shaw, Jr. Director of Magical Security Percival Graves accuses Newt of conspiring with the infamous dark wizard Gellert Grindelwald, and decides to destroy Newt's suitcase and erase Jacob's recent memories of magic. Newt and Tina are sentenced to immediate death in secret, but Queenie and Jacob rescue them, and they escape after retrieving Newt's suitcase. Following a tip from Tina's old goblin informant Gnarlack, the foursome find and re-capture the last of the escaped creatures. Meanwhile, Graves approaches Mary Lou's adopted son Credence and offers to free him from his abusive mother. In exchange, Graves wants Credence to find an Obscurus, which he believes has caused the mysterious destructive incidents around the city. Credence finds a wand under his adopted sister Modesty's bed. Mary Lou assumes it is Credence's wand, but Modesty says it is hers. When Modesty is about to be punished, the Obscurus kills Mary Lou and her eldest daughter Chastity. Graves arrives, and after Credence leads him to Modesty, who he assumes is the Obscurus's host, he dismisses Credence as being a Squib and refuses to teach him magic as he had previously promised. Credence reveals he is the real host, having lived longer than any other host due to the intensity of his magic. In a fit of rage, Credence transforms and attacks the city. Newt finds Credence hiding in a subway tunnel, but he is attacked by Graves. Tina, who knows Credence, arrives and attempts to calm him, while Graves tries to convince Credence to listen to him. As Credence begins to settle back into human form, Aurors arrive and apparently disintegrate him to protect the magical society; however, a tiny Obscurus fragment escapes. Graves admits his plan of unleashing the Obscurus to expose the magical community to the No-Majs and framing Newt for it, and angrily claims that MACUSA protects the No-Majs more than themselves. As the president orders the Aurors to apprehend Graves, he attacks and begins to defeat all of them. Newt manages to subdue him with one of his beasts, and uses a revealing spell to expose Graves as Grindelwald in disguise, who is taken into custody. MACUSA fears their secret world has been exposed, but Newt releases his Thunderbird to disperse a potion as rainfall over the city that erases all New Yorkers' recent memories, as MACUSA wizards repair the destruction. Queenie kisses Jacob goodbye as the rain erases his memories. Newt departs for Europe, but promises to return and visit Tina when his book is finished; he also anonymously leaves Jacob a case of silver Occamy eggshells to fund his bakery. Jacob's breads and pastries are subconsciously inspired by Newt's creatures, and Queenie visits him in his shop. Fantastic Beasts and Where to Find Them panel at the 2016 San Diego Comic Con International (left to right): director Yates; actors Redmayne, Waterston, Sudol, Fogler, Farrell, Miller. Eddie Redmayne as Newt Scamander: an introverted British wizard, magizoologist and an employee at the Ministry of Magic. Scamander is the future author of the Hogwarts School of Witchcraft and Wizardry standard textbook Fantastic Beasts and Where to Find Them. Redmayne was cast in June 2015. Matt Smith and Nicholas Hoult were also considered for the role. Katherine Waterston as Tina Goldstein: a grounded, down-to-earth witch and a former Auror employed by MACUSA. She longs to fight for what is right, but was demoted to a position well below her skill level. Dan Fogler as Jacob Kowalski: a genial No-Maj cannery worker and aspiring baker who is accidentally exposed to the New York City magical community upon meeting Newt. Alison Sudol as Queenie Goldstein: Tina's younger sister and roommate, she's described as a free-spirited and big-hearted bombshell, and is a naturally born and skilled Legilimens. The film is Sudol's feature film debut. Ezra Miller as Credence Barebone: Mary Lou's troubled adopted son who is an Obscurial. Samantha Morton as Mary Lou Barebone: a narrow-minded No-Maj and the sinister leader of the New Salem Philanthropic Society or "The Second-Salemers", a group whose goals include exposing and killing wizards and witches. Jon Voight as Henry Shaw Sr.: a newspaper owner and the father of U.S. senator Henry Shaw Jr. and Langdon Shaw. Carmen Ejogo as Seraphina Picquery: the President of MACUSA, the Magical Congress of the United States of America. As such, she is the American equivalent of a Minister for Magic in the United Kingdom. Colin Farrell as Percival Graves: a high-ranking Auror and Director of Magical Security for MACUSA. He is charged with the protection of wizards. Ron Perlman as the voice of Gnarlack: a goblin gangster who owns a magical speakeasy nightclub called "The Blind Pig". Ronan Raftery as Langdon Shaw: the youngest of Henry Shaw Sr.'s sons, who begins to believe in magic. Josh Cowdery as Henry Shaw Jr.: the eldest of Henry Shaw Sr.'s sons, an arrogant and cruel U.S. senator. Faith Wood-Blagrove as Modesty Barebone: a haunted young girl and the youngest of Mary Lou's adopted children. Wood-Blagrove was chosen for the role following thousands of auditions in an open casting call. Jenn Murray as Chastity Barebone: the eldest of Mary Lou's adopted children. Kevin Guthrie as Mr. Abernathy: Tina and Queenie's MACUSA supervisor. Johnny Depp (cameo) as Gellert Grindelwald: an infamous powerful dark wizard who seeks to lead a new Wizarding Order, believing in wizarding superiority. Zoë Kravitz (cameo) as Leta Lestrange: Newt's former love who betrayed his trust. First announced in September 2013, the project marks Rowling's debut as a screenwriter. The film sees the return of producer David Heyman, as well as writer Steve Kloves, both veterans of the Potter film franchise. After Alfonso Cuarón declined involvement, Warner Bros. announced that David Yates would direct at least the first instalment of a planned trilogy. James Newton Howard was contracted to compose the score. Principal photography commenced on 17 August 2015, at Warner Bros. Studios, Leavesden and was completed in January 2016. Several scenes were also shot on location in London. After two months, the production moved to the Cunard Building and St George's Hall in Liverpool, which was transformed into 1920s New York City. Framestore in London produced the visual effects for the film. On 9 April 2016, it was announced that James Newton Howard would write and compose the film's score. On 24 October, Pottermore published an official first look at the film's main theme composed by Howard. The main theme incorporated John Williams' themes from earlier films, such as "Hedwig's Theme". The soundtrack was released by WaterTower Music on 18 November 2016. Fantastic Beasts and Where to Find Them had its world premiere at Alice Tully Hall in New York City on 10 November 2016. The film was released worldwide on 18 November 2016, in 2D, 3D and the new IMAX 4K Laser system. It would premiere one day earlier in a number of other countries, including Argentina, Australia, Brazil, Germany and Italy, on 17 November. The film would be released in a total of 1,028 IMAX screens worldwide (388 screens in the United States and Canada, 347 screens in China, 26 screens in Japan and 267 screens in other countries). This marked the second time—after Doctor Strange—that a film secured a release in over 1,000 IMAX screens worldwide. On 4 November 2015, Entertainment Weekly released the first official publicity shots of the film, containing pictures of characters Newt, Tina, and Queenie, and production and filming being held in various sets designed to mirror 1920s New York City. On 10 December 2015, it was announced that an "announcement trailer" would be released five days later, on 15 December. Along with the one-minute trailer, a teaser poster was released. During "A Celebration of Harry Potter" at Universal Orlando Resort in February 2016, a featurette was released showcasing several interviews with various cast and crew members, as well as the first official behind-the-scenes footage. On 10 April 2016, the first "teaser trailer" was released during the MTV Movie Awards. On 10 August, more information and publicity shots for the film were released through Entertainment Weekly, with new information on Ezra Miller's character Credence Barebone and the news that Zoë Kravitz would have a role in the series. New images released include the quartet running down a New York City alleyway, David Yates chatting to stars Katherine Waterston and Eddie Redmayne on the set in front of a blown out subway station, Colin Farrell's character Percival Graves interrogating an arrested and handcuffed Newt, and Graves and Credence putting up anti-magic propaganda. On 26 April 2016, it was announced that the film's script would be released in the form of a book on 19 November. The book, titled Fantastic Beasts and Where to Find Them: The Original Screenplay, was written by Rowling herself. In an effort to avoid revealing plot details before the film's release, the novelisation of the film was released on 19 November 2016, the day after the film's premiere. On 7 March 2016 a trailer-preview was released about the History of Magic in North America as it is in the Harry Potter universe. On 7 October 2016, Rowling also released on Pottermore four pieces of writing exclusively as an introduction to the film Fantastic Beasts and Where to Find Them, titled History of Magic in North America. It includes information about scourers in North America, brutal and violent magical mercenaries who played a significant role in the historic Salem witch trials of the 1600s, as well as info about various American wand makers; the role magic played in World War I; Native American magic; the foundation of MACUSA; the harsh enforcement No-Maj/Wizarding segregation; and life in 1920s Wizarding America; with info about wand permits and prohibition. On 28 June 2016, Rowling released a second part to her History of Magic in North America series, concerning the fictitious Ilvermorny School of Witchcraft and Wizardry, detailing the founding of the pre-eminent American Wizarding academy and allowing users to sort themselves into one of the four houses of the school. The school itself is mentioned in the film. A "story pack" based on Fantastic Beasts and Where to Find Them was released for the video game Lego Dimensions by WB Games and TT Games. The pack includes a constructible model of MACUSA, figures of Newt Scamander and a Niffler, and a six-level game campaign that adapts the film's events. The pack was released on the same day as the film, alongside a "fun pack" containing figures of Tina Goldstein and a Swooping Evil. The cast of the film reprises their roles in the game. Fantastic Beasts was released on Digital HD on 7 March 2017, and on 4K UHD, 3D Blu-ray, Blu-ray and DVD on 28 March 2017. Fantastic Beasts and Where to Find Them grossed $234 million in the United States and Canada and $580 million in other countries for a total of $814 million. The film was made on a budget of $180 million, with an additional $150 million spent on marketing. Worldwide, the film grossed $219.9 million during its opening weekend from around 64 markets in 24,200 screens, both the fifth-biggest in Rowling's wizarding cinematic universe, and the seventh-biggest of the month of November. IMAX totalled $15 million from 605 screens. Deadline Hollywood calculated the net profit of the film to be $164 million, when factoring together all expenses and revenues for the film, making it the ninth-most profitable release of 2016. Fantastic Beasts went on general release in the United Kingdom and Ireland on 18 November 2016. It debuted with £15.33 million ($19.15 million) from 666 cinemas, the biggest debut of any film in 2016, ahead of the previous record holder, Batman v Superman: Dawn of Justice (£14.62 million). The film was surpassed during the last days of 2016 by Rogue One: A Star Wars Story which gained over one million pounds. In the United States and Canada, tracking had the film grossing $68–85 million in its opening weekend, with some estimates going as high as $100 million. The film was released on 18 November in 4,143 cinemas, of which 388 were IMAX screens, and over 3,600 were showing the film in 3D. It grossed $29.7 million on its first day, the second-lowest opening day among Rowling's adaptations (behind the $29.6 million Friday of Harry Potter and the Chamber of Secrets). This included $8.75 million it earned from Thursday night preview screenings beginning at 6 pm in 3,700 cinemas. In total, the film earned $74.4 million in its opening weekend, falling in line with projections and finishing first at the box office, but recorded the lowest opening among Rowling's Harry Potter universe. It made $8 million from 388 IMAX screens, $9 million from 500 premium large format locations and $1.75 million from Cinemark XD. The film's opening was considered a hit taking into account how the story was not based on a popular existing source, and the film itself was void of the franchise's main character, Harry Potter. It was the top choice among moviegoers, representing 47% of the weekend's total $157.6 million tickets sales. On its second Friday, it had a gradual drop of 37% ($18.5 million) from the week before, the second-best Friday drop for any Harry Potter film, behind The Philosopher's Stone. This was in part due to Black Friday, the most lucrative day of the Thanksgiving Day stretch. It ended up grossing $45.1 million in its second weekend (a drop of just 39.4%), finishing 2nd at the box office behind newcomer Moana. Outside North America, the film debuted day-and-date in 63 countries, along with its North American release, where it was projected to gross $90–125 million in its opening weekend. It opened 16 November 2016 in 9 countries, earning $6.9 million from 5,070 screens. It opened in 38 more countries on 18 November, earning $16.6 million for a total of $23.5 million in two days. In three days, it made $53.6 million. Through Sunday, 20 November, the film had a five-day opening weekend of $145.5 million from 63 countries, above the initial projections. It earned another $132 million in its second weekend after a large debut in China and Japan. It recorded the biggest opening day of all-time among the Harry Potter franchise in Korea ($1.7 million), the Philippines ($1.2 million), the UAE ($429,000) and Ukraine, the second biggest in Mexico ($1.8 million), Russia and the CIS ($1.7 million), Brazil ($1.3 million) and in Indonesia ($480,000), all behind Harry Potter and the Deathly Hallows – Part 2 and the third biggest in the United Kingdom ($5.4 million), behind Part 1 and Part 2. It also scored the second biggest Warner Bros. opening of all-time in the Czech Republic and Slovakia. Notably, France opened with $1.8 million, Spain with $1.4 million, and Germany with $1 million ($2 million including paid previews). In terms of opening weekend, the film posted the biggest opening among the Harry Potter franchise in 16 markets, including South Korea ($14.2 million, also the third-biggest opening for the studio), Russia ($9.8 million) and Brazil ($6.4 million), the biggest opener of the year in Germany ($10.2 million), Sweden, Belgium and Switzerland and the biggest Warner Bros. debut in those along with France ($10.2 million), Holland and Denmark. Italy debuted with $6.6 million, the biggest for a U.S. film in the country. Australia opened with $7.4 million, followed by Mexico ($5.8 million) and Spain ($4.5 million). It opened in China on 25 November alongside Disney's animated Moana but did not face significant competition from it. It earned $11.2 million on its opening day from 11,600 screens, the best among the Rowlings cinematic universe. In total, it had an opening weekend of $41.1 million, dominating 60% of the top five films with 70,000 screenings per day. This alone surpassed the entire lifetime total of all Harry Potter films save the last one. Similarly in Japan—typically the biggest or second biggest market for the previous Harry Potter films—it debuted with $15.5 million, besting the total lifetime of all the previous films except for Harry Potter and the Half-Blood Prince and Deathly Hallows – Part 2. The film also set a number of IMAX records. In total, the opening weekend was worth $7 million from 276 screens, which is the second-highest ever in the Wizarding World, behind Deathly Hallows – Part 2. In 33 territories, it opened at number one. Moreover, it's also the third-highest-grossing November international IMAX opening ever, and the No. 1 start for IMAX in November in 19 countries including Japan ($1.1 million), the UK, Russia, Germany, and the Netherlands. In China, it had the biggest IMAX opening among the franchise with $5.1 million from 347 IMAX screens. Overall, the film has earned a global cumulative total of $19.1 million from the format. It has become the highest-grossing film in Rowling's cinematic universe in Russia ($16.7 million) and the second-highest in South Korea ($24.6 million). China ($41.1 million) the United Kingdom ($37.6 million), followed by Germany ($18.4 million), France ($16.7 million), and Spain ($13.3 million) are the film's biggest-earning markets. The review aggregator website Rotten Tomatoes sampled 315 critics and judged 75% of the reviews as positive, with an average rating of 6.84/10. The website's critical consensus reads, "Fantastic Beasts and Where to Find Them draws on Harry Potter's rich mythology to deliver a spinoff that dazzles with franchise-building magic all its own." Metacritic, which assigns a normalised rating to reviews, gives the film a score 66 out of 100, based on 50 critics, indicating "generally favorable reviews". Audiences polled by CinemaScore gave the film an average grade of "A" on an A+ to F scale, while PostTrak reported filmgoers gave it a 90% positive score and a 74% "definite recommend". Peter Bradshaw of The Guardian gave the film five out of five, hailing it as "a rich, baroque, intricately detailed entertainment" and a "terrifically good-natured, unpretentious and irresistibly buoyant film". NME's Larry Bartleet also gave it five out of five, calling it "more enchanting to your inner kid than the Potter films ever were". IndieWire's Eric Kohn gave the film a B+ saying that it "delivers the most satisfying period fantasy since Tim Burton's Sweeney Todd: The Demon Barber of Fleet Street ", and that its layers of sophistication made it one of the best Hollywood blockbusters of the year. Mike Ryan of Uproxx gave the film a positive review, writing "Newt Scamander is nothing like Harry, but it has to be this way. It all has to be different. And it is, but, again, with just enough 'sameness' to make us feel like we are at home again. I'm looking forward to wherever these movies are taking us". John DeFore of The Hollywood Reporter wrote that the film is "likely to draw in just about everyone who followed the Potter series and to please most of them". However, New York Magazine's David Edelstein deemed the film a "distinctly unmagical slog", remarking that the beasts "aren’t especially fantastic and the effects are too blandly corporate to be exhilarating". In a mixed review, Ignatiy Vishnevetsky of The A.V. Club found the film "patchy but occasionally charming." Initially, in October 2014, the studio announced the film would be the start of a trilogy. In July 2016, David Yates confirmed that Rowling had written the screenplay for the second film and had ideas for the third. In October 2016, Rowling announced that the series would now comprise five films. The first sequel, titled Fantastic Beasts: The Crimes of Grindelwald, was released on 16 November 2018. ^ a b c "FANTASTIC BEASTS AND WHERE TO FIND THEM (2016)". AFI Catalog of Feature Films. Archived from the original on 24 July 2018. Retrieved 24 July 2018. ^ "Fantastic Beasts and Where to Find Them (12A)". British Board of Film Classification. 28 October 2016. Archived from the original on 28 September 2017. Retrieved 28 October 2016. ^ Newman, Kim (18 November 2016). "Fantastic Beasts and Where to Find Them review: a fiddly start for J.K. Rowling's wizarding prequels". British Film Institute. Archived from the original on 6 December 2017. Retrieved 29 November 2016. ^ "Fantastic Beasts and Where To Find Them". British Council. Archived from the original on 28 September 2017. Retrieved 1 December 2016. ^ Rubin, Rebecca (13 November 2018). "Box Office: 'Fantastic Beasts: The Crimes of Grindelwald' Sequel Heads for $250 Million Global Launch". Variety. Archived from the original on 14 November 2018. Retrieved 13 November 2018. ^ a b Barnes, Brooks (7 November 2016). "Warner Bros., Quietly Thriving, Recasts Its Own Story". The New York Times. Archived from the original on 9 November 2016. Retrieved 11 November 2016. ^ a b c d e D'Alessandro, Anthony (19 November 2016). "'Fantastic Beasts' Gobbles Up Teen Girl, Vinny Paz & 'Billy Lynn'...But Is 'Potter' Spinoff Big Enough for a New Franchise?". Deadline Hollywood. Archived from the original on 20 November 2016. Retrieved 20 November 2016. ^ a b "Fantastic Beasts and Where to Find Them (2016)". Box Office Mojo. Archived from the original on 29 July 2017. Retrieved 19 April 2017. ^ McNary, Dave (16 November 2017). "'Fantastic Beasts 2' First Cast Photo, Title Revealed". Variety. Archived from the original on 17 December 2017. Retrieved 10 December 2017. ^ a b c McMillan, Graeme (1 June 2015). "Eddie Redmayne Officially Cast in 'Harry Potter' Prequel 'Fantastic Beasts and Where to Find Them'". The Hollywood Reporter. Archived from the original on 3 June 2015. Retrieved 2 June 2015. ^ Kroll, Justin (10 April 2015). "Eddie Redmayne the Frontrunner to Star in 'Harry Potter' Spinoff (Exclusive)". Variety. Archived from the original on 12 April 2015. Retrieved 11 April 2015. ^ Hawkes, Rebecca (25 March 2015). "Matt Smith cast in Harry Potter spin-off Fantastic Beasts?". The Daily Telegraph. Archived from the original on 26 June 2015. Retrieved 25 May 2015. ^ a b Kroll, Justin (15 June 2015). "'Fantastic Beasts': Katherine Waterston Lands Female Lead in 'Harry Potter' Spinoff". Variety. Archived from the original on 16 June 2015. Retrieved 16 June 2015. ^ "Pottermore - Everything we've learned about 'Fantastic Beasts'". Pottermore. Archived from the original on 8 December 2015. Retrieved 29 November 2015. ^ a b Fleming, Mike Jr. (10 July 2015). "Dan Fogler Cast In 'Fantastic Beasts And Where To Find Them' As Jacob: Comic Con". Deadline Hollywood. Archived from the original on 11 July 2015. Retrieved 11 July 2015. ^ Rowling, J.K. [@jk_rowling] (15 August 2015). "Well, I think it's widely known that the characters of (Porpen)tina and Queenie are sisters, but not that their surname is Goldstein" (Tweet). Retrieved 17 August 2015 – via Twitter. ^ Kroll, Justin (9 July 2015). "'Fantastic Beasts': Alison Sudol Joins Eddie Redmayne in 'Harry Potter' Spinoff (Exclusive)". Variety. Archived from the original on 10 July 2015. Retrieved 9 July 2015. ^ a b c Osorio, Paulette (17 August 2015). "Filming Gets Underway on 'Fantastic Beasts and Where to Find Them'" (Press release). Warner Bros. Pictures. Business Wire. Archived from the original on 7 October 2016. Retrieved 17 August 2015. ^ Kroll, Justin (24 June 2015). "Ezra Miller Eyes 'Harry Potter' Spinoff 'Fantastic Beasts' (Exclusive)". Variety. Archived from the original on 26 June 2015. Retrieved 25 June 2015. ^ a b The Deadline Team (17 August 2015). "David Yates-Helmed 'Fantastic Beast' Filming Starts Up". Deadline Hollywood. Archived from the original on 18 August 2015. Retrieved 17 August 2015. ^ Kit, Borys (5 October 2015). "'Harry Potter' Spinoff 'Fantastic Beasts' Casts Jon Voight (Exclusive)". The Hollywood Reporter. Archived from the original on 7 October 2015. Retrieved 5 October 2015. ^ Ford, Rebecca (5 August 2015). "Colin Farrell Joins Harry Potter Spinoff 'Fantastic Beasts' (Exclusive)". The Hollywood Reporter. Archived from the original on 7 November 2017. Retrieved 5 August 2015. ^ Kit, Borys (8 October 2015). "Harry Potter Spinoff 'Fantastic Beasts' Casts Ron Perlman (Exclusive)". The Hollywood Reporter. Retrieved 9 October 2015. ^ "Fantastic Beasts actress chosen from open auditions". BBC. 5 August 2015. Archived from the original on 8 August 2015. Retrieved 7 August 2015. ^ Sneider, Jeff (6 August 2015). "J.K. Rowling's 'Fantastic Beasts' Casts 'Brooklyn' Actress Jenn Murray (Exclusive)". TheWrap. Archived from the original on 7 August 2015. Retrieved 7 August 2015. ^ Douglas, Edward (20 November 2016). "Fantastic Beasts Producer David Heyman Explains Why They Cast Johnny Depp". Collider. Archived from the original on 21 November 2016. Retrieved 20 November 2016. ^ Ford, Rebecca (10 August 2016). "'Harry Potter' Spinoff 'Fantastic Beasts' Adds Zoe Kravitz (Exclusive)". The Hollywood Reporter. Archived from the original on 12 August 2016. Retrieved 10 August 2016. ^ "Fantastic Beasts and Where to Find Them: A worthy, magical addition to the Harry Potter universe - Firstpost". 20 November 2016. Archived from the original on 20 December 2016. Retrieved 29 November 2016. ^ Tartagloine, Nancy (12 September 2013). "Warner Bros, J.K. Rowling Team For New 'Harry Potter'-Inspired Film Series". Deadline Hollywood. Archived from the original on 13 September 2013. Retrieved 12 September 2013. ^ "'Harry Potter' producer David Heyman officially on board to produce 'Fantastic Beasts and Where To Find Them'". Page to Premiere. Archived from the original on 19 October 2013. Retrieved 18 October 2013. ^ Chitwood, Adam (25 May 2014). "Alfonso Cuaron Says He Will Not Direct Fantastic Beasts and Where to Find Them". The Daily Beast. Archived from the original on 27 May 2014. Retrieved 25 May 2014. ^ "X-Men's Jane Goldman Joining Fables Film Writing Team, Updates on Rowling's Fantastic Beasts". The Mary Sue. 20 January 2015. Archived from the original on 22 January 2015. Retrieved 20 January 2015. ^ The Deadline Team (21 August 2014). "David Yates in Talks For 'Harry Potter' Spin-Off 'Fantastic Beasts'". Deadline Hollywood. Archived from the original on 21 August 2014. Retrieved 11 April 2018. ^ "James Newton Howard to Score 'Fantastic Beasts and Where to Find Them'". Film Music Reporter. 7 April 2016. Archived from the original on 9 April 2016. Retrieved 3 May 2016. ^ Fogler, Dan [@mrdanfogler] (16 August 2015). "#fantasticBeasts tomorrow the adventure really begins! my mustache is ready! are you?! so blessed!..." (Tweet). Retrieved 17 August 2015 – via Twitter. ^ "Filming To Begin August 17th". FantasticBeastsMovies.com. 12 August 2015. Archived from the original on 4 March 2016. Retrieved 17 August 2015. ^ Weintraub, Steven [@colliderfrosty] (11 August 2015). "Fantastic Beasts and Where to Find Them starts filming in London on Monday. Heard most of the shoot is in London" (Tweet). Retrieved 17 August 2015 – via Twitter. ^ Kollewe, Julia (3 November 2016). "Harry Potter special effects firm looks east with sale to China group". The Guardian. ISSN 0261-3077. Archived from the original on 4 November 2016. Retrieved 2 December 2016. ^ "'Fantastic Beasts': James Newton Howard to score JK Rowling's 'Harry Potter' spin-off - NME". 9 April 2016. Archived from the original on 26 October 2016. Retrieved 26 October 2016. ^ Szalai, Georg (7 October 2016). "Pottermore Debuts 'Fantastic Beasts' Theme Tune". The Hollywood Reporter. Archived from the original on 28 October 2016. Retrieved 27 October 2016. ^ Bacardi, Francesca (7 October 2016). "Fantastic Beasts and Where to Find Them Theme Song Includes a Nod to a Harry Potter Classic". E! News. Archived from the original on 23 November 2016. Retrieved 22 November 2016. ^ Derschowitz, Jessica (7 October 2016). "Fantastic Beasts and Where to Find Them theme debuts on Pottermore". Entertainment Weekly. Archived from the original on 11 October 2016. Retrieved 27 October 2016. ^ Kilday, Gregg (13 May 2014). "New J.K. Rowling Movie 'Fantastic Beasts and Where to Find Them' Gets Release Date". The Hollywood Reporter. Archived from the original on 17 May 2014. Retrieved 13 May 2014. ^ a b c d e f Tartaglione, Nancy (20 November 2016). "'Fantastic Beasts' Climbs To Magical $145.5M Overseas – Intl Box Office Update". Deadline Hollywood. Archived from the original on 20 November 2016. Retrieved 21 November 2016. ^ a b c d e f g Tartaglione, Nancy (27 November 2016). "'Fantastic Beasts' Climbs To $474M Global; 'Moana' Catches $16.3M Offshore Wave – Intl Box Office". Deadline Hollywood. Archived from the original on 28 November 2016. Retrieved 28 November 2016. ^ Fantastic Beasts [@FantasticBeasts] (10 December 2015). "Your first glimpse at #FantasticBeasts will arrive on December 15. pic.twitter.com/8Qi2QFfG7X" (Tweet). Retrieved 15 December 2015 – via Twitter. ^ Fantastic Beasts [@FantasticBeasts] (15 December 2015). "One hour until the #FantasticBeasts trailer. pic.twitter.com/nSgAxvUZmd" (Tweet). Retrieved 15 December 2015 – via Twitter. ^ Fantastic Beasts [@FantasticBeasts] (15 December 2015). "The Announcement Trailer for #FantasticBeasts is here. t.co/kVFBnSN3b7" (Tweet). Retrieved 15 December 2015 – via Twitter. ^ McCabe, Adam (2 February 2016). "Our favorite moments from 'A Celebration of Harry Potter 2016' at Universal Orlando". Inside the Magic. Archived from the original on 21 December 2016. Retrieved 12 December 2016. ^ Sullivan, Kevin P. "Fantastic Beasts and Where to Find Them trailer debuts at MTV Movie Awards". Entertainment Weekly. Archived from the original on 12 April 2016. Retrieved 11 April 2016. ^ a b Gettell, Oliver. "Harry Potter spinoff Fantastic Beasts casts Zoe Kravitz". Entertainment Weekly. Archived from the original on 12 August 2016. Retrieved 10 August 2016. ^ Kroll, Justin. "Zoe Kravitz Joins 'Harry Potter' Spinoff 'Fantastic Beasts'". Variety. Archived from the original on 11 August 2016. Retrieved 10 August 2016. ^ Hibberd, James. "Fantastic Beasts: First look at Ezra Miller's mysterious character". Entertainment Weekly. Archived from the original on 11 August 2016. Retrieved 10 August 2016. ^ Maloney, Jennifer. "The 'Fantastic Beasts and Where to Find Them' Screenplay to be Published as a Hardcover". The Wall Street Journal. Archived from the original on 21 August 2016. Retrieved 26 April 2016. ^ Cain, Sian. "The screenplay of Fantastic Beasts is a rare miss for the wizarding world". The Guardian. Archived from the original on 25 November 2016. Retrieved 26 April 2016. ^ Goldberg, Matt. "'History of Magic in North America' Trailer Promises New Stories from J.K. Rowling". The Guardian. Archived from the original on 1 May 2016. Retrieved 26 April 2016. ^ Parker, Brinton. "J.K. Rowling Just Gave Us Everything to Know Before Fantastic Beasts". POPSUGAR. Archived from the original on 11 October 2016. Retrieved 6 October 2016. ^ Lee Young, Paula. "Pottermore problems: Scholars and writers call foul on J.K. Rowling's North American magic". Salon. Archived from the original on 2 July 2016. Retrieved 1 July 2016. ^ Anderton, Ethan. "'Fantastic Beasts' Featurette Shines a Light on Ilvermorny, the American Hogwarts". Slashfilm. Retrieved 1 July 2016. ^ a b Barnes, Brooks (20 November 2016). "'Fantastic Beasts' Is a Hit for Warner Bros". The New York Times. Archived from the original on 22 November 2016. Retrieved 22 November 2016. ^ "Worldwide Openings". Box Office Mojo. Archived from the original on 23 June 2011. Retrieved 22 November 2016. ^ Fleming, Mike Jr. (27 March 2017). "No. 9 'Fantastic Beasts and Where to Find Them' Box Office Profits – 2016 Most Valuable Movie Blockbuster Tournament". Deadline Hollywood. Archived from the original on 28 March 2017. Retrieved 27 March 2017. ^ Gant, Charles (22 November 2016). "Fantastic Beasts sprinkles magic dust over the UK box office". The Guardian. Archived from the original on 22 November 2016. Retrieved 23 November 2016. ^ Gant, Charles (4 January 2017). "Rogue One storms past Fantastic Beasts into 2016 top spot at UK box office". The Guardian. Archived from the original on 28 December 2017. Retrieved 11 April 2018. ^ D'Alessandro, Anthony (27 October 2016). "Putting 'Fantastic Beasts' Opening Projections in Perspective". Deadline Hollywood. Archived from the original on 30 October 2016. Retrieved 31 October 2016. ^ McClintock, Pamela (17 November 2016). "Box-Office Preview: 'Fantastic Beasts' Hopes to Make Magic With $70-80M U.S. Debut". The Hollywood Reporter. Archived from the original on 18 November 2016. Retrieved 17 November 2016. ^ Brevet, Brad (17 November 2016). "'Fantastic Beasts' Eyes Fantastic Opening that Could Top $90 Million". Box Office Mojo. Archived from the original on 19 November 2016. Retrieved 18 November 2016. ^ Mendelson, Scott (19 November 2016). "'Fantastic Beasts' Box Office: Not-So-Magical $29.7M Friday For J.K. Rowling Prequel". Forbes. Archived from the original on 20 November 2016. Retrieved 19 November 2016. ^ Mendelson, Scott (18 November 2016). "Box Office: 'Fantastic Beasts' Finds Just $8.75M On Thursday". Forbes. Archived from the original on 19 November 2016. Retrieved 19 November 2016. ^ "Box Office Top 20: 'Fantastic Beasts' summons $74.4 million". Associated Press. 21 November 2016. Archived from the original on 22 November 2016. Retrieved 22 November 2016. ^ D'Alessandro, Anthony (21 November 2016). "Will 'Moana' Slay 'Fantastic Beasts' Over The Thanksgiving Stretch?". Deadline Hollywood. Archived from the original on 22 August 2017. Retrieved 22 November 2016. ^ Mendelson, Scott (26 November 2016). "Friday Box Office: 'Fantastic Beasts' Tops $355M Global, 'Doctor Strange' Passing $200M U.S." Forbes. Archived from the original on 27 November 2016. Retrieved 27 November 2016. ^ D'Alessandro, Anthony (24 November 2016). "'Moana' Rings Up $81M+ & Ranks As 2nd Best Thanksgiving Debut After 'Frozen'". Deadline Hollywood. Archived from the original on 20 August 2017. Retrieved 27 November 2016. ^ Tartaglione, Nancy (13 November 2016). "'Doctor Strange' A Marvel As Pic Nears $500M WW, 'Billy Lynn' Walks With $13.2M; 'Arrival' Lands $10.2M – Intl Box Office". Deadline Hollywood. Archived from the original on 20 November 2016. Retrieved 14 November 2016. ^ D'Alessandro, Anthony; Tartaglione, Nancy (15 November 2016). "'Fantastic Beasts' Box Office To Wolf Down As Much As $200M+ Worldwide: Weekend Preview". Deadline Hollywood. Archived from the original on 16 November 2016. Retrieved 16 November 2016. ^ a b c d e Tartaglione, Nancy (17 November 2016). "'Fantastic Beasts' Unleashes $16.6M on Day 2 Overseas; $23.5M Running Cume". Deadline Hollywood. Archived from the original on 18 November 2016. Retrieved 18 November 2016. ^ Scott Mendelson (17 November 2016). "'Fantastic Beasts' Box Office: J.K. Rowling Prequel Nets Promising $6.9M In Overseas Debut". Forbes. Archived from the original on 18 November 2016. Retrieved 18 November 2016. ^ McClintock, Pamela; Ford, Rebecca (18 November 2016). "Weekend Box Office: 'Fantastic Beasts' Heads for $75M-Plus Opening After $29.7M Friday". The Hollywood Reporter. Archived from the original on 20 November 2016. Retrieved 20 November 2016. ^ Tartaglione, Nancy (26 November 2016). "'Fantastic Beasts' Boasts $227M+ Through Friday; Bests All 'Potter' Bows In China – Intl Box Office Update". Deadline Hollywood. Archived from the original on 26 November 2016. Retrieved 27 November 2016. ^ Frater, Patrick (24 November 2016). "'Fantastic Beasts' Sees Powerful Chinese Opening Day". Variety. Archived from the original on 27 November 2016. Retrieved 27 November 2016. ^ Frater, Patrick (28 November 2016). "China Box Office: 'Fantastic Beasts' Enjoys $40 Million Opening". Variety. Archived from the original on 28 November 2016. Retrieved 28 November 2016. ^ "Fantastic Beasts and Where to Find Them (2016)". Rotten Tomatoes. Fandango. Archived from the original on 6 June 2017. Retrieved 6 September 2018. ^ "Fantastic Beasts and Where to Find Them Reviews". Metacritic. CBS Interactive. Archived from the original on 28 November 2016. Retrieved 18 November 2016. ^ CinemaScore [@CinemaScore] (18 November 2016). "@FantasticBeasts @eddieredmayne @jk_rowling @colinfarrell Congratulations on your A #CinemaScore grade!" (Tweet). Retrieved 10 April 2017 – via Twitter. ^ Bradshaw, Peter (13 November 2016). "Fantastic Beasts and Where to Find Them review – JK Rowling goes steampunk". The Guardian. Archived from the original on 13 November 2016. Retrieved 13 November 2016. ^ Bartleet, Larry. "Fantastic Beasts and Where to Find Them – Film Review". NME. Archived from the original on 29 January 2017. Retrieved 18 January 2017. ^ Kohn, Eric (13 November 2016). "'Fantastic Beasts and Where to Find Them' Review: The 'Harry Potter' Prequel Is One of the Best Blockbusters of the Year". IndieWire. Archived from the original on 14 November 2016. Retrieved 13 November 2016. ^ Ryan, Mike (12 November 2016). "'Fantastic Beasts And Where To Find Them' Is A Worthy, But Much Different, Successor to Harry Potter". Uproxx. Archived from the original on 14 November 2016. Retrieved 12 November 2016. ^ DeFore, John (13 November 2016). "'Fantastic Beasts and Where to Find Them': Film Review". The Hollywood Reporter. Archived from the original on 13 November 2016. Retrieved 13 November 2016. ^ Edelstein, David (17 November 2016). "Fantastic Beasts Is a Distinctly Unmagical Slog". Vulture. Archived from the original on 13 December 2016. Retrieved 18 January 2017. ^ Vishnevetsky, Ignatiy (17 November 2016). "The Harry Potter prequel Fantastic Beasts And Where To Find Them can't find itself". The A.V. Club. Archived from the original on 28 March 2018. Retrieved 28 March 2018. ^ Nordyke, Kimberly (24 January 2017). "Oscars: 'La La Land' Ties Record With 14 Nominations". The Hollywood Reporter. Archived from the original on 2 December 2017. Retrieved 24 January 2017. ^ "Oscar Nominations: Complete List". Variety. 24 January 2017. Archived from the original on 24 January 2017. Retrieved 24 January 2017. ^ Hipes, Patrick. "Art Directors Guild Awards Nominations: 'Rogue One', 'Game Of Thrones' & More". Deadline Hollywood. Archived from the original on 6 January 2017. Retrieved 5 January 2017. ^ Copeland, Wesley (10 January 2017). "BAFTA 2017 Nominations Announced". IGN. Archived from the original on 10 January 2017. Retrieved 10 January 2017. ^ Petski, Denise (3 January 2017). "Casting Society Unveils 2017 Artios Awards Film Nominees". Deadline Hollywood. Archived from the original on 17 February 2017. Retrieved 7 January 2017. ^ "Excellence inFantasy Film". costumedesignersguild.com. Archived from the original on 26 February 2017. Retrieved 26 February 2017. ^ "La La Land Leads with 12 Nominations for the 22nd Annual Critics' Choice Awards". Critics' Choice. 1 December 2016. Archived from the original on 3 December 2016. Retrieved 1 December 2016. ^ "Diversity in Media Awards 2017". Archived from the original on 24 August 2018. Retrieved 14 November 2018. ^ Pape, Danny (7 February 2017). "Star Wars: Rogue One Leads Empire Awards 2017 Nominations". Flickreel.com. Archived from the original on 3 March 2017. Retrieved 3 March 2017. ^ Norum, Ben (9 December 2016). "Evening Standard British Film Awards: Kate Beckinsale and Hugh Grant crowned". Evening Standard. Archived from the original on 9 December 2016. Retrieved 9 December 2016. ^ "Here's the full list of nominees for this year's Irish Film and Television Awards". Entertainment.ie. Archived from the original on 12 March 2017. Retrieved 9 April 2017. ^ "2017 nominees" (PDF). local706.org. Archived (PDF) from the original on 2 February 2017. Retrieved 26 February 2017. ^ Park, Andrea (15 November 2016). "People's Choice Awards 2017: List of Nominations - CBS News". CBS News. Archived from the original on 16 November 2016. Retrieved 15 November 2016. ^ McNary, Dave (2 March 2017). "Saturn Awards Nominations 2017: 'Rogue One,' 'Walking Dead' Lead". Variety. Archived from the original on 3 March 2017. Retrieved 3 March 2017. ^ Wilson, Cavin (12 December 2016). "St. Louis Film Critics Association announces nominations for awards". St. Louis Dispatch. Retrieved 15 December 2016. ^ Vulpo, Mike (24 May 2016). "Teen Choice Awards 2016 Nominations Announced: See the "First Wave" of Potential Winners". E!. Archived from the original on 25 May 2016. Retrieved 25 May 2016. ^ Giardina, Carolyn (10 January 2017). "'Rogue One' Leads Visual Effects Society Feature Competition With 7 Nominations As 'Doctor Strange,' 'Jungle Book' Grab 6 Each". Hollywood Reporter. Archived from the original on 12 January 2017. Retrieved 10 January 2017. ^ "The 2016 WAFCA Awards Nominations". 3 December 2016. Archived from the original on 8 December 2017. Retrieved 4 December 2016. ^ Bell, Amanda (1 July 2016). "Fantastic Beasts Movie Sequel Has Already Been Written". ScreenRant.com. Archived from the original on 29 January 2018. Retrieved 9 November 2016. ^ Khatchatourian, Maane; McNary, Dave (13 October 2016). "'Fantastic Beasts and Where to Find Them' to Be Five-Film Franchise". Variety. Archived from the original on 29 October 2016. Retrieved 9 November 2016. ^ Sims, Andrew (15 October 2014). "WB names David Yates 'Fantastic Beasts' director". hypable.com. Archived from the original on 14 January 2015. Retrieved 9 November 2016. ^ Barraclough, Leo (3 August 2016). "'Fantastic Beasts' Sequel in the Works With J.K. Rowling and David Yates, Release Date Set". Variety. Archived from the original on 5 November 2016. Retrieved 9 November 2016. Rowling, J. K. (2016). Fantastic Beasts and Where to Find Them: The Original Screenplay. New York: Arthur A. Levine Books. ISBN 978-0-325-40112-6. Wikimedia Commons has media related to Fantastic Beasts and Where to Find Them.